Welcome to the Stamp Review Crew: Zoo Babies blog hop! So excited to be sharing ideas for the Zoo Babies stamp set...it is such a sweet little collection of animals that you can find at many zoos! Whether you've just come over from Dawn Tidd's Tiddbits by Dawn blog or are just starting here, I hope you'll take the time to hop on through to see all of the creations! Today's hop gave me a fabulous opportunity to put together idea's for Britt's upcoming birthday! It is in May and she'll be celebrating with her preschool friends. I decided to use Zoo Babies to create a set of party pieces -- cupcake toppers, festive napkins, and juice box embellishments -- for a fun, festive celebration! Thankfully the girls and I baked some cupcakes one night this past week that I could use for a little staging! For the cupcake toppers you need card stock circles (1-3/8" and 1-3/4"), toothpicks, Sticky Strip, and Stampin' Dimensionals. The stamped Zoo Babies images make these adorable without a whole lot of fuss! 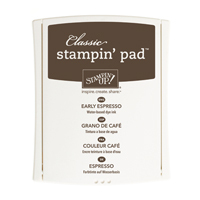 A little stamping is all you need to for the napkins! I stamped 5 each of 4 different Zoo Babies images -- giraffe, alligator, rhinoceros, and elephant. However, the more I think about it, I definitely should stamp some more for the pre-school set! The rhino with the bit of white twine is a juice box embellishment. Initially I planned to tie these onto some paper straws, however, I realized that juice boxes were likely a better choice than open cup beverages. This image gives a better look at the juice box. This is simply a band of card stock in Coastal Cabana that has been attached to the box with Sticky Strip. I did use a bone folder to loosen up to the fibers of the card stock before adhering -- definitely an important step! For the final products I will actually be cutting wider strips of card stock to better cover the full height of the box sides. Had to include this image of Brooklyn holding the cupcake topper! She has asked that we make some of these for her doll and make sure that we celebrate her doll's birthday on the same day that we celebrate her sister's birthday! Hope you that you are feeling inspired to pull out this set and to get creating! I had lots of fun creating these party pieces and can't wait to get production underway for Britt's big day! Be sure to hop along to visit Betty Traciak and the other Stamp Review Crew members for more Zoo Babies ideas! Kerry Willard Bray -- YOU ARE HERE! We're at it again! The Stamp Review Crew is sharing the oh so lovely Work of Art stamp set. I received mine at the Stampin' Up! new catalog premiere in the spring and absolutely love this set! What I love most aboput the Stamp Review Crew blog hops is the incredible diversity of projects that we see that all stem from our featured stamp set. The days of the week stamps are from the #PLxSU Day to Day photopolymer stamp set -- perfect for this project! I'm loving the "ink swashes" from Work of Art as the backdrop for the sentiments...how about you? Be sure to hop along and enjoy all of the creations this week! Extreme Fairy House Makeover for the Pals June Hop! You may just be starting the blog hop or may have come from Michelle Quinno at Shell's Life on the Pals Hop. If you get off track at any time, the full lineup below my signature will help you move along from blog to blog so you see all of the amazing creations. Today's very special project features the new Lullaby Designer Series Paper, along with the new Hello Honey and Mossy Meadow cardstock. There's a little Crisp Cataloupe and Old Olive, too. And, as you could tell from my post title, today is the transformation of a fairy house. Regular readers of my blog may remember mentioning that I had picked up some shelves made to look like house late in the winter. My plan was to turn them into fairy houses for the girls for Easter but one cold winter day, I could tell they really needed a special project to do so I pulled out the houses for us to do together. Neededless to say the end result was not at all what I was imagining. The grass roof is made of alternating strips of Mossy Meadow and Old Olive. The Fringe Scissors made creating the roof a breeze! The shine comes from the layer of ModPodge over top. This floral medallion dresses up the house and I think the pearls are a sweet touch. Use my flower tutorial to create a similar one for a project you are creating. The outside walls are adorned with some stamped on grass (from Gorgeous Grunge) and lots and lots of butterflies. To create the gentle crease to get the wings up, I laid the butterflies of my Stampin' Pierce Mat and then pressed down on the center with my bone folder. The ceiling, walls, and floor (you'll see that next) feature a different print from the Lullaby paper. I added the Hello Honey "baseboard" and "trim" to help hide any places where the paper did not go on perfectly straight. Here's a closer look at the floor and the fairies. Every fairy has her own name and Brooklyn had us make up a chart so the rest of us can keep them all straight (she has them memorized). And yes, for those looking really closely, that is a mermaid in the back left corner...she apparently has special abilities to be in the forest with the fairies! As I worked away on the house, Britt said "wow, momma, this fairy house is so beautiful" and Brooklyn said she wants to me dress hers up too. We shall see as she changed her mind a few hours later! WHAT? NO FAIRY HOUSE TO MAKE?! Even if you have no fairy house to decorate, I hope you'll take some of the ideas shared today and incorporate them into various cards and other paper crafting projects that you are creating! And be sure to add the Lullaby Designer Series Paper to your next order...it is beautiful! 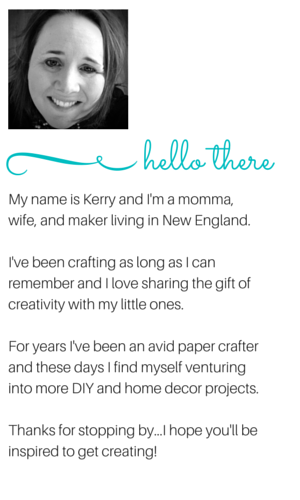 The next stop is Sherrie Gross at Stampin' Sunshine on the Pals Blog Hop! Use the next button immediately below to visit Sherrie's blog or scroll down for the full line-up. Thanks for visiting and I hope to see you next month! Flower pots painted and filled by Brooklyn and Britt. Swallowtail stamp block art by me...doubles as a puzzle for little ones. Wishing all who are mothers a wonderful day! Have you ever been half way to a celebration (and by half way I mean an hour or so into a 3-1/2 hour drive) and realized that while you were so busy making a cute set of note cards and a really fun gift bag (and documenting the whole thing for your blog) that you somehow managed not to make a card to go with the gift? Has it happened to you? It did to me. Guess this means I need to make a really fabulous card when the baby arrives since I completely missed the boat for the shower! These should give you a good sense for the scale -- all the sheets you see are standard 8-1/2" x 11" pieces of copier paper that I printed out here at home. MDS makes it so easy to create coloring pages like this and you can make them with any digital stamp brush set that has an outline. They are quick to make up and you can keep the little ones happy with coloring! Next time you have a gathering that will include litttle ones, consider making up a batch of coloring sheets and setting them out with a nice fresh box of crayons! The coloring pages are certainly for more than just special occassions, they are perfect for a rainy day activity or even just a little quiet time. P.S. Click here to view all retiring products. If you see something you like, don't delay in ordering...all items are while supplies last. 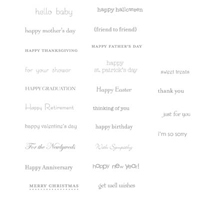 Yesterday I shared with you some sweet and simple thank you cards that I made to give at a baby shower. Today I want to share both the packaging that I created for the thank you notes and also for the store bought gifts. 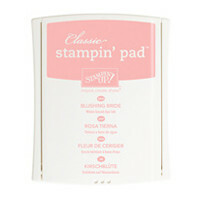 One of the things I love about Stampin' Up! is the ability to easily make coordinating items and that does not mean just paper based ones! To create the belly band, I brayered a strip (1.5" x 11") of Whisper White card stock and carefully folded it around the packet. It was not quite long enough to go all the way around so I made created the little "tag" to hold it all together. The "tag" is securely hold the belly band together thanks to a bit of Sticky Strip. I liked the idea of the "tag" being a little wider and that is what I did and I also wanted a little contrast and chose to use Coastal Cabana card stock. I debated if I would add any sort of sentiment and ultimately decided to echo what was used on the cards. The main gift that we are giving at the shower is a set of Aden + Anais swaddling blankets. We used these with Britt and they are truly incredible! Perfect for swaddling, covering loosely over a stroller or car seat when dashing into a store in the sun, covering a changing table, and more. Though Britt has not been swaddled in ages (she's nearly 3), we still have ours. These days the girls use them as fun capes, togas, picnic blankets and all sorts of other things that they think up! When working on the tote bag image, Brooklyn asked me to make some coloring pages. It is so easy to do with MDS and this was one that I created. I increased the size of the stamp images significantly and printed the pages on 8-1/2" x 11" paper. Brooklyn colored in this page, I laminated it, and then tucked in the tote bag too! I'll be off at the shower with the girls this afternoon and won't be creating anything. How about you? Will you be making soemthing today? Hello friends! Today I'm sharing an idea for some sweet and simple thank you notes that are perfect for a baby shower or baby welcome gift! The girls and I are headed to a baby shower this weekend and I think thank you cards are a perfect addition to the gift. These are quick and easy to make and won't cost a penny more to mail...and let's face it, no new parent needs to worry about a special trip to the post office to get things weighed! The background was added using a brayer and I love that this technique ensures that each card is one of a kind! Tomorrow you'll get to see how I've wrapped up the note cards and the coordinating gift bag that I am making to hold the cards and store bought gifts! Retiring producst are selling quickly! Click here to view all retiring products. If you see something you like, don't delay in ordering...all items are while supplies last. Get Ready for Earth Day with the Pals! Welcome to the Pals Blog Hop for April! To celebrate Earth Day, this month we are showcasing projects that feature recycled, re-purposed, or earthy/recycling themed elements. You may just be starting the blog hop or may have come from Amanda at Inkfair, #21, on the Pals Hop. If you get off track at any time, the full lineup below will help you move along from blog to blog so you see all of the amazing creations. Two paper fairy crowns! The base of each crown is a rolled down paper bag (bottom cut off first) and it is decorated with cuts from the Fun Flowers, Beautiful Butterflies, and Autumn Accents Bigz dies. A little green raffia forms a vine along the crown and I used hot glue to hold everything in place. They were easy to make and the girls absolutely love them! Brooklyn was completely cool with modelling the crown for all of you. Britt on the other hand was not. She did, however, let me photograph her standing next to the crowns and some fairies in our play area. I just love the streaks of warm spring sun peeking through the fence panel. The little fairy figurines came from my inlaws' home. Brooklyn picked them to keep from their yard when they got ready to move last year...I think we have about seven in total! We had a gorgeous sunny day on Sunday when I photographed these. This project was inspired by one I saw on The Crafty Crow. It is a blog that showcases projects that you can make with (or for) kids -- projects from all across the internet. The original source is the blog Happy Hooligans and on that blog, "Jackie and the Hooligans" made the crowns using silk flowers -- thank you for the inspiration! With our Earth Day theme, I felt that paper was the best choice for the flowers and leaves. This is also a great project for using up left over pieces of card stock...simply place where you want on the dies before cutting. And, trust, me this is an easy project! It does take a moment to get the hang of rolling down the bag, but once you do, you are set! Know someone who'd love a fairy crown? Make one for them today or simply pass along this idea! The next stop is Brian King, #23, on the Pals Blog Hop! Thanks for visiting and I hope to see you again soon! Hello friends! Today I'm excited to share with you an interactive calendar that we've created at our house. I like to think of this as a pre-school calendar since it has been created for the girls to use. You can certainly purchase similar calendars -- some even incorporate a weather station -- however most of the ones I've ever seen just simply don't match the color scheme in our home, and, let's face it, we like to make things! I'm going to walk you through the making of the calendar with a whole lot of photos and for those who'd like to create one, I have a PDF available with instructions and a supply list. Before we get started I'll tell you that the first few photos are not fabulous. I worked on the calendar foundation at night and the work surface I was using does not have the best light so please excuse the quality of the images. Let's get going! The night-time pics are over now...thanks for bearing with me! The days of the week and the numbers are all removable! The plan is to add on a month each morning as the month goes on. And the reason for the days to be removable is that we could take these off for learning the order of the day -- Brooklyn (5) has this down pat, Britt (almost 3) sings along with the days of the week song and I am sure will know them soon enough. Do take a closer look above and see if you notice anything about the 10, 11, 12. Yes, that would be the letter "I" from the Morning Post Alphabet set. The number one has gone missing this past week -- fingers crossed that we eventually find it! Rather than having blank squares, Brooklyn declared we should have something for each season. She wanted a snowman for winter, flowers for spring, a sun for summer, and a maple leaf (yes, she was specific about that...perhaps because her class just had a field trip to a maple sugar shack last week) for fall. Alas, I did not have all those so we went with the images above from the retired Sock Monkey stamp set. The calenar is designed to be interactive and that meant Velcro. Erik and the girls went out this weekend and picked some up. I was thrilled that they found some mini Velcro dots that have one piece that is nearly invisible -- the dots is just above the "ies" in my Peonies and Paper Chains watermark above. The Stampin' Up! Mini Muslin Bag is just the right size for the holding the numbers that are not up on the calendar. A little ribbon and some stamping dress it up. The bag is hanging from a Command Brand Decorating Clip -- it is small and clear and these are the ones you see being advertised for hanging Christmas lights. No calendar would be complete without the months, however I did not have space right on the canvas I used. Hanging these from the ribbon with an O-ring works well and we can simply pop it off and flip over the month as needed. 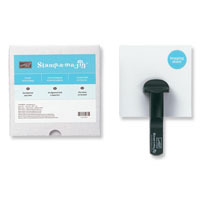 The month and day tags were created using MDS -- the months are stamp images and were printed directly onto Designer Series Paper whereas the days of the week were typed in as text and printed on Whisper White cardstock. There you have it! A fabulous learning tool that looks equally nice in our home! Hoping the girls have a whole lot of fun with this next few years! For instructions and a supply list, download the free PDF tutorial! So, what do think of it? Please sure to leave a comment to let me know. Wishing you a creative day! Thanks for stopping by! Zoo Babies on the Go! This weekend Brooklyn had a birthday party to attend. 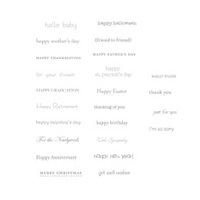 Something that I think always makes a wonderful gift (or addition to the gift) is a set of thank you cards. In a very short time I was able to make up a total of 8 cards like the ones shown above! They are single layer cards with just a little bit of stamping and the background applied with a brayer. These took a little longer than some others that we give simply because the rhino was precisely perched atop the sentiment. There was definite precision involved in the stamping -- thank you Stamp-a-ma-jig for getting everything aligned! Once complete, I placed the cards in a cello bag and tied on a bit ribbon -- festive and simple wrapping. My original plan was to place them in a Tag a Bag bag but alas there is not a single one at my house...time to order more! The garland was attached to bag with a couple of full size clothespins -- easy as can be! Click for free PDF tutorial with instructions for the thank you cards and garland! There's a 10+ page tutorial available with the details on all the projects I made along with a bonus section containing 25 gift iodeas for little ones. Hop over to the Zoo Babies post. Thanks so much for visiting! Come back soon!